In 1877, John F. Stratton, who was then 25 years old and operating a custom flour mill for his father at Winona, Ohio, heard that a new railroad was to be built through the town of Flushing, Ohio. John Stratton decided that he would like to build a mill in Flushing, and with his father's support, he immediately began to pursue the task. John Stratton wanted to locate the mill away from the train tracks so that locomotives would not frighten the farmers' horses. A suitable tract of land was selected not far from, but considerably above, the eastern end of a single-track 1500 foot tunnel through which the trains traveled. The "cut" or approach to this tunnel is nearly 3000 feet long, and it was found by chemical analysis that a certain layer of sandstone which was being removed in abundance from this approach would be good building stone. The initial structure of the mill, which measured about 30 by 40 feet with an attached engine room of approximately 20 by 30 feet, was constructed of this stone laid as a ruble wall. John Stratton purchased a 12 by 20 inch steam engine and boiler from the Buckeye Engine Company of Salem, Ohio. As part of the purchase agreement, he arranged to use the Buckeye Engine Company's woodworking machinery to turn the wooden pulleys and construct the long round and hexagon flour bolts. He also built the corn sheller which was installed in the mill. This hard, continuous work made John Stratton an easy victim of typhoid fever, and he died late in September 1878 at 26 years of age. Construction on the building was nearing completion, needing only the roof. The engine and most of the machinery were on the grounds, having been hauled 25 miles by team and wagon from Bridgeport. At the time of John's Stratton's death he left his widow and a son, George W. Stratton, who was then two years old. At the age of 14, in 1890, George began to work in the mill firing the boiler and learning the miller's trade. He attended Friends Boarding School in Barnesville, Ohio, and spent a year at Westtown Friends Boarding School in Westtown, PA. 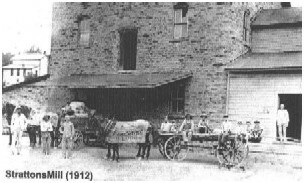 Returning home from Pennsylvania in the summer of 1896, he leased the mill and took full charge of it, before he was 20 years of age. George Stratton operated the mill continuously until near the end of his life on September 1959. In his later years, one of his five sons, William Stratton, assumed responsibility for the mill, and operated it until the early 1960s, at which point competition from larger commercial millers made continuing operations unprofitable. Over the years, the major products of the Stratton Flour Mill were: Flushing Flour, Cookie Flour, and Flushing Fancy Pastry Flour. The mill depended on the high quality soft winter wheat that was produced throughout eastern Ohio. In the 1920s, the mill began producing Stratton's Self-Rising Whole Wheat Pancake Flour, which was promoted via commercial advertising and interviews over the Wheeling, West Virginia radio station, WWVA, and other media. The mill offered a free sample of the pancake flour to anyone who would write to request it. George Stratton became known as the "Pancake Man", and numerous letters were received addressed only to The Pancake Man, Flushing, Ohio. Documents, photographs, and correspondence related to the Stratton Flour Mill and the community of Flushing have been preserved, as have some of the original flour sacks (including the "sample" sacks for the self-rising pancake flour) and many of the letters addressed to "The Pancake Man". 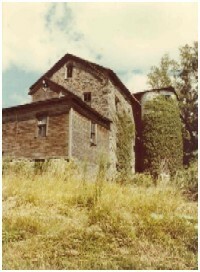 The mill itself, in need of extensive repairs, is intact. The mill contains the 50 horsepower Buckeye horizontal single cylinder diesel engine that was installed in 1937, and which was used continuously into the 1950s. Many of the original milling components that were installed in the mill in 1877 and 1878, including the corn sheller, pulleys, and flour bolts are still in place. 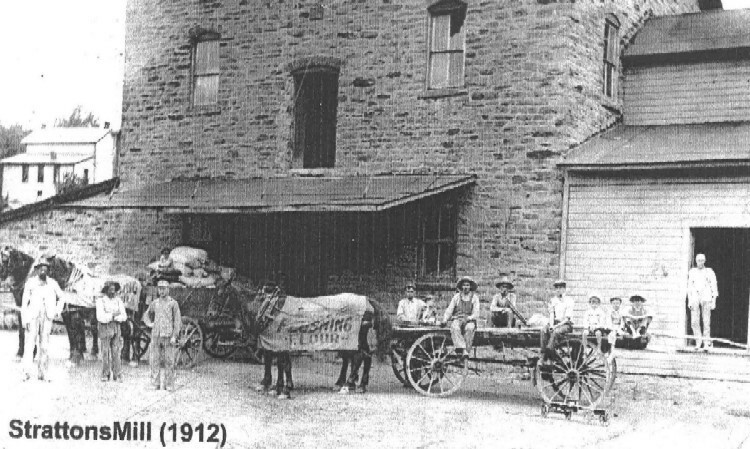 Captions: Top: Stratton Mill as it appeared in 1912. Note the blankets on the horses, which advertise "Flushing Flour". 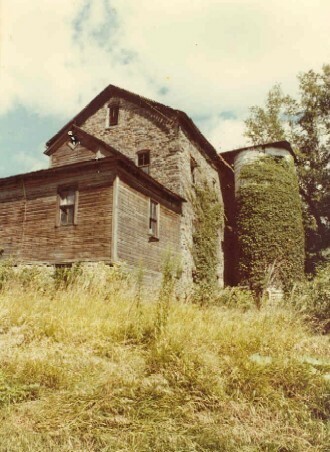 Bottom: Stratton Mill as it appeared in 1989, when the property was acquired by the Stratton Mill Foundation. Click images for larger versions.